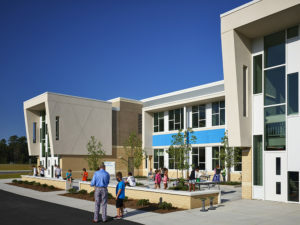 SfL+a Architects and Firstfloor Energy Positive (Firstfloor) announce that two Horry County public schools have been awarded nominations under the Educational Interiors Showcase. These 2018 awards were given to those who excel in education design including architecture and environmental awareness. Socastee Elementary received a silver citation with St. James Intermediate being appointed with honors as Outstanding Design in the Common Areas. These newly designed buildings provide teachers and students an advantage as it allows them to work and learn in a visually and technologically progressive environment. The team’s energy-positive schools aim to provide creative solutions while staying cost-effective. Students and teachers alike benefit greatly from these modernized and sustainable buildings. Features include a patio for outdoor learning, iBar, project pod, brainstorm room, flex class, lecture hall, common areas and much more. By providing children with open learning environments, it promotes a better sense of community, creative nature, more flexibility, various landscapes for learning, sustainability, as well as helping teachers cater to all students and their different learning needs. 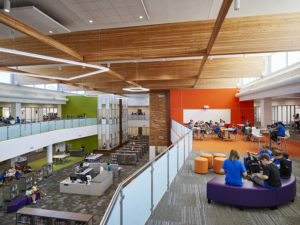 With an audience of over 182,000, these awards are given to schools and universities who epitomize architectural performance and green sustainability standards. Selection for these awards means both schools will be featured in the November publication of American School and University, highlighting these outstanding projects and their national acclaim. These design sourcebooks are used all year by administrators at schools across the country including internationally.